Tori finds inspiration in her supportive family–her parents are the hardest working people she knows and motivated her to take the leap into entrepreneurship at just 26 years of age. Her interest in baking was encouraged by her grandmother, who mentored Tori from a young age: “I got my start in baking the first time my grandma let me stick my fingers in the bowl,” she recalls. Countless bake-offs (Grandma still has the touch) and a Cross-Canada road trip later, Tori found herself re-considering the impact of her eating habits on the environment and ultimately chose to live a vegan lifestyle. Tori endeavoured to “veganize” her Grandmother’s beloved recipes–discovering how natural ingredients such as flax, coconut oil and agave come together to create whole proteins and foods that simply taste and feel better. Tori’s Bakeshop offers a repertoire of thoughtfully-crafted, delicious, cholesterol-free vegan baked goods that are preservative-free and refined sugar free (with a wide selection of gluten-free items): croissants, cinnamon buns, chocolate bars, cupcakes, brownies, tea biscuits, pies, cookies, and loaves. Tarts, chocolates, cheesecakes and cookies are among the raw selection, which will increase over the summer months. Tori’s Bakeshop: Let Them Eat Green! Exhaustive tours of New York City’s better baking establishments helped Tori connect her ideas and develop a strong vision for her own bakery. Tori’s Bakeshop cheerfully marries industrial design elements, such as oversized whisk pendant lights, with romantic touches: salvaged wood tables (built by Tori herself) and interior reclaimed windows–a favourite feature that give café guests an opportunity to enjoy a view of the kitchen. The design statement is accented with pops of mint green; from the Organic hemp and cotton staff uniforms, inspired by 1940s general store stock clerk uniforms and designed by talented local costume designer Claire Levick, to the Elektra K. coffee machine and patterned wallpaper. The bakery’s signature hue also acts as a playful reminder of Tori’s ‘green’ commitment. Wherever possible, Tori’s Bakeshop aims to reduce its footprint, whether it’s using only compostable packaging materials (summer plans include building a backyard compost), local seasonal ingredients, chemical-free cleaning products or a bicycle delivery service (coming soon!). Tori shops for her unprocessed ingredients locally and uses vendors with sustainability mandates such as Merchants of Green Coffee. Tori’s Bakeshop is located at 2188 Queen Street East, in The Beach, Toronto.Open Wednesday through Saturday, from 8 A.M. to 8 P.M. and Sundays from 8 A.M. to 6 P.M.
Tori’s Bakeshop is Toronto’s first eat-in vegan bakery and café. 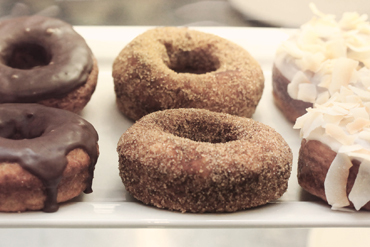 Baker and Proprietor Tori Vaccher celebrates all things natural and organic at Tori’s Bakeshop, offering fresh baked (and raw) treats that radiate goodness. Tori’s delicious vegan and gluten-free goods are made with love in a chemical-free, preservative-free and refined sugar-free environment. Tori Lives and bakes in The Beach. 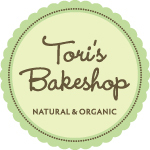 Follow Tori on twitter: @torisbakeshop or visit Torisbakeshop.ca.